One more ingredient helped unify Egypt. Hieroglyphs! They still enchant people all over the world. Sumeria (an equally ancient civilization, in modern Iraq) also created a writing system, but Egypt’s has a magic that still captivates people. What is it? 1. We have some clues in the above photo from the temple of Amun-Re at Karnak. The three symbols that are repeated emblazon lots of temples, tomb walls and texts on papyrus rolls. The cross with the loop on top was called Ankh, and it embodied the force of life. The crooked staff to its left stood for Was, which meant well-being. The pillar to the Ankh’s right, with the rings at the top, symbolized Djet, which meant eternity. All three comprised a dream team of what ancient Egyptians aspired for. These symbols are often repeated many times in hieroglyphic writings. They were often used in magical formulas, which priests read or chanted. Beauty was a key aspect of these formulas. 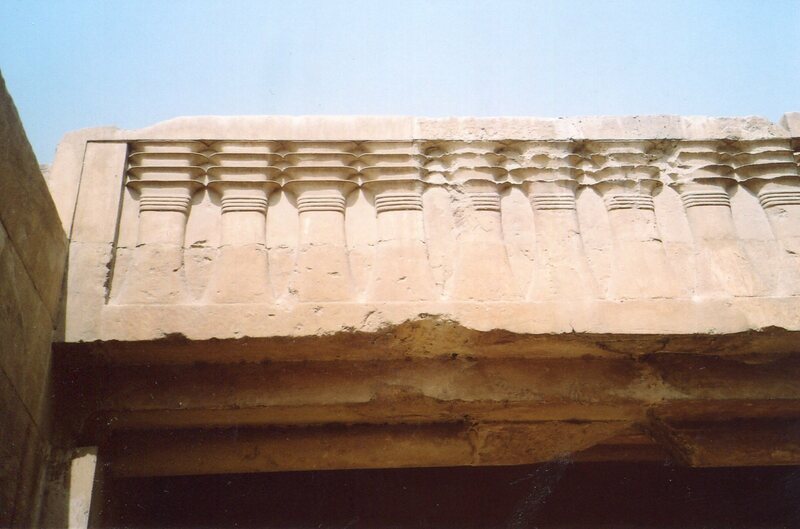 The hieroglyphs in the photo are finely proportioned. Their spacing is equally elegant. Back in the day, they were painted in bright colors. 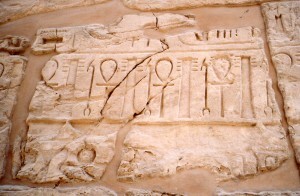 Above, we see the Djet symbol repeated by the court where King Djoser conducted the Sed festival. This rite boosted the Pharaoh’s sacred power after 30 years of rule. It was like a king’s energy drink–a Pharaoh’s Red Bull. The fine proportions of these symbols made the festival more effective. Their beauty was in line with Maat–with the order of the universe and state. The beautiful hieroglyphs added sympathetic magic. So Egyptian Hieroglyphs don’t just describe a world of beauty and order which people hoped would last forever. They help ensure its creation and maintenance. Beauty was power in ancinet Egypt. 2. 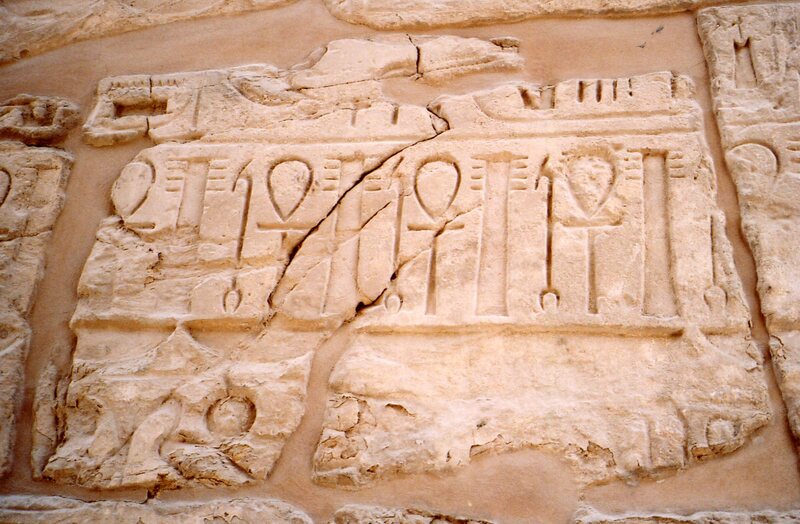 These hieroglyphs became a sacred court tradition that lasted for more than 3,000 years. Ancient Egypt did have other writing systems, which were more mundane. But scribes learned hieroglyphs as the eternal order of things, and they never deviated from it. 3. 30% of hieroglyphs were of animals. This sacred order included all of nature. Egyptian hieroglyphs expressed and created a world of harmony and tolerance. Their forms still work magic all around the world–I met several people in China 4 months ago who wanted to go to Egypt. Let’s hope this magic still works in Egypt. Its Muslim Brotherhood runs the country’s most popular political party, called Freedom and Justice. The middle classes and small business owners support it. Many Westerners and Egyptians fear an Islamic party running a historically secular state. Will women be forced to wear veils? Will alcohol be banned (this could hurt the tourism industry, which makes up 10% of Egypt’s gross domestic product)? The Al Nour Party is favored by the poor and religious sheiks. Will it promote the industry that can create jobs in this country riddled with unemployment? Can it give Egypt’s education system the upgrade it desperately needs? Egypt’s ancient art forms can help guide people in today’s fledgling democracy. Balanced perspectives, rather then extreme opinions, are needed. The harmony of the whole, rather than Mubarak’s cronyism, or political factions, is key. Egypt’s past can help people build a future. They need this ancient land’s secret sauce as much as ever.